I am totally off track with about 8 projects but since my wash day was a bit different this week I figured I could add in the reviews I mentioned and then revisit my very different wash day later. So the first thing I was asked about was the As I Am Leave in Conditioner. The As I Am line is meant for naturals but after learning more about what should and shouldn't be in my products throughout this hair journey I opted to give the line a try. I have to say I have been happy with everything I've tried from them except the Moisture Milk but it could be that my hair just doesn't respond well to it. It doesn't look like you can request a sample of items anymore but be on the look out for that on their website http://www.asiamnaturally.com to see if they are ever doing so. You get enough product to make a good decision on what to buy or avoid. As for the As I Am Leave In I love it. I actually took more time to see how my hair responded to it since I knew I'd be doing this review. But before I get to that let's talk about a few things. An eight ounce bottle runs around 11 dollars at Sally's and the As I Am website. It's under 10 bucks at Sally's if you have the club card. It has a relatively light creamy coconut smell to it which isn't surprising since coconut is amongst the first ingredients listed on the bottle which looks like this. The conditioner itself is pretty thick. Which for me is a good thing as it feels like it penetrates my hair a bit better than thinner conditioners. And as I noted a few weeks ago it actually helps detangle my hair a bit before I have to do much of anything to it. My hair is VERY thick the further away from relaxer I get and this feels good without being heavy. The photo below is what it looks like out of the bottle. I use about twice that much on my entire head but I tend to be heavy handed with products. I think it does a great job of keeping my hair protected and moisturized. I just need to work on keeping my scalp from being dry and that has nothing to do with the leave in for me. I do add Taliah Waajid's leave in as well but again as I was actually paying attention to my product application on this wash day I can't say I need it. I just want to have it as a chaser as it were. Truly I think the entire As I Am line is great for relaxed heads or naturals. Just like anything though you have to figure out if your hair will respond to it. As someone with dry hair I can say that my hair shaft tends to feel great till at least midweek when I use this product. If I did more to baby my hair between washes it would probably last the entire week between was days. Now the Dr. Miracle's deep conditioner was not planned to be part of my product line up. 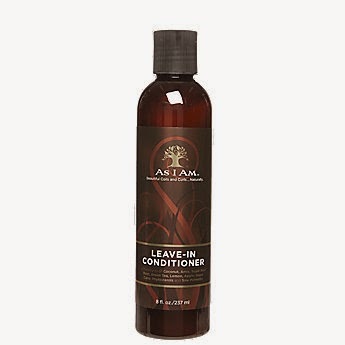 I had been using a deep conditioner from the As I Am line (Hydration Elation) but my Sally's quit stocking it. An 8 ounce jar is for sale on the As I Am website for 16 dollars if anyone wants that though. As I was almost out of HE I opted for Dr. Miracle's and hoped HE would be back before I ran out of the new option. The new option's actual name is Dr. Miracle's Double Deep Moisturizing Masque. It's retailing at Sally's for nearly half the price of the HE for a 12 ounce jar (9.99 w/o card, 8.99 w/card). It's labeled as both being new and a repair product. I hadn't seen it before I bought it so I'll take their word for it but as you can see on the box it is also sulfate/paraben free. The box tells you to leave it on your hair for 10 minutes under a cap but I tend to leave this on my hair for 20 minutes to an hour depending on how distracted I am. My hair feels refreshed and smells great after I'm done. This is a bit more creamy than the As I AM HE was or the leave in conditioner is. I don't find this to be a good or bad thing the texture is just different. It also has a light pleasant smell so that you aren't overwhelmed by the scent of it. If there is a down side to this product is it is often easy to scoop out more than you planned lol. I ended up just applying this amount to my hair but didn't necessarily need it all. I would consider it on par with if not better than As I Am's Hydration Elation. Both do a great job but this product feels much lighter and gave my scalp a light tingle while it was in my hair. Great product and you really can't beat the price. Let me know if you have other questions, these are my first reviews lol. Oh and for those that this would matter to the PH on the As I Am Leave In and Hydration Elation are 5.5.